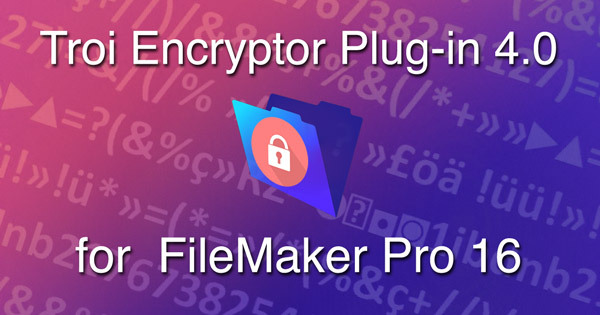 Encryption plug-in adds new script steps and online help for FileMaker Pro 16. Subscribe to our newsletter to be notified about new releases, updates and other news related to Troi plug-ins. The mailing list is hosted by MailChimp. To read more press releases (before 2016) please see this older web page. We are using cookies to improve our website. You can find out more about which cookies we are using or switch them off in settings.